Making pumpkin rösti in Switzerland just seems like a promising idea. Fall is the perfect time of year to make this variation of the Swiss classic. No matter where you are in the Northern Hemisphere, there will be plenty of fresh pumpkins wherever you choose to look – a bonus if you can find those starchy kabocha varieties which combine the nuttiness of chestnuts with the sweet earthiness of sweet potatoes…oh, and with a healthy note of pumpkin flavor thrown in as well. 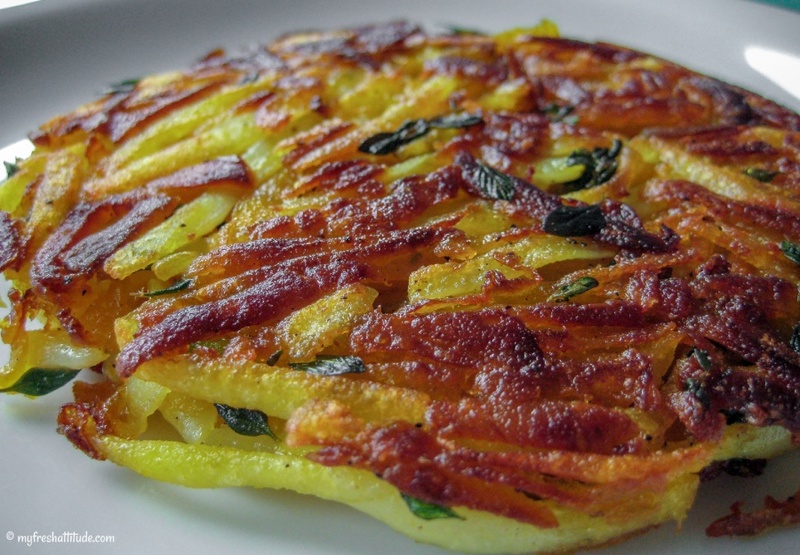 Of course, potatoes are the other major ingredient in this delicious rösti – and guess what? Yep, they are also in peak form this time of year. Just be sure to choose the correct variety, which would be something called waxy in most places. Don’t use the type of potato you would use to make a mash or bake in the oven – they will be far too mushy for a proper rösti. Yield: makes enough for two medium rösti.